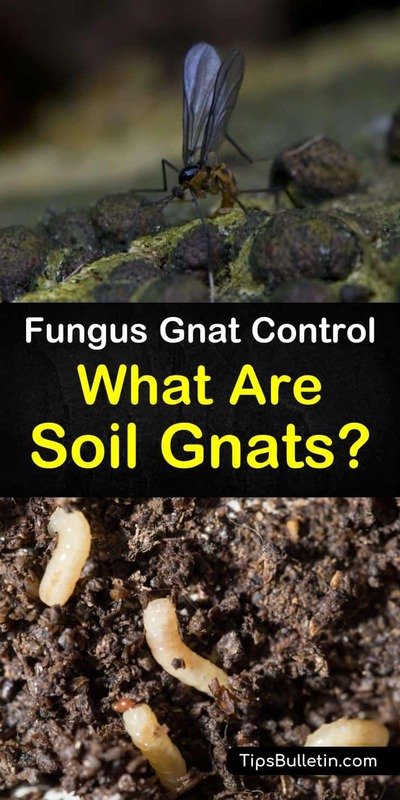 Fungus Gnat Control - What Are Soil Gnats? 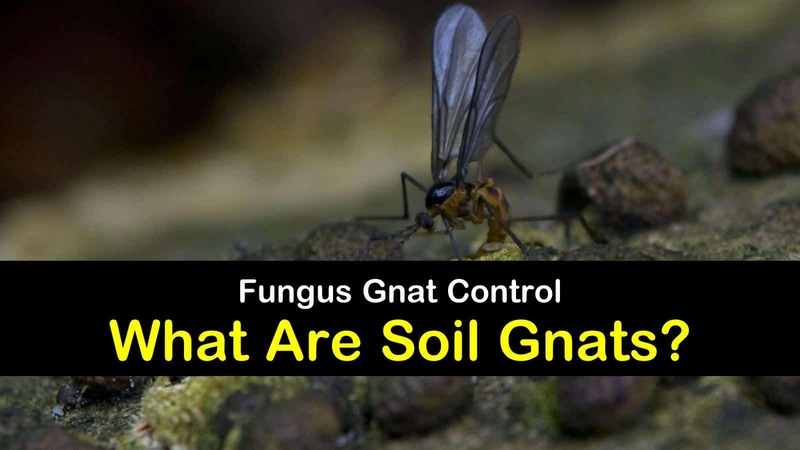 Fungus Gnat Control – What Are Soil Gnats? If you have a vegetable garden or potted plants in your home, one battle that you may be fighting is with soil gnats, or fungus gnats as they are more commonly known, breeding in the moist soil and eating the delicate plant roots, causing your plants to turn brown and die. While the tiny flying insects might be a nuisance as they buzz around your head, adult fungus gnats, which are a part of the Sciaridae family of insects, are harmless. It is the fungus gnat larvae that damage your healthy plants, spread disease, and kill vegetable seedlings. What Do Soil Gnats Look Like? Can I Use a Soil Drench to Kill Fungus Gnat Larvae? Soil gnats, look like miniature versions of mosquitos. They have a shiny black head, elongated abdomens, long legs, and transparent wings. The black head of fungus gnats sits closely on the thorax and centered between the wings. They have a relatively short life cycle, only living for about four weeks. The egg laying, female adult gnats will lay up to 300 eggs, in the top two to three inches of potting soil during their short life. When the eggs hatch, the gnat larvae feed on the organic matter in the area. After about ten days the larvae enter the pupal stage, where they spend the next several days undergoing a metamorphosis into the flying adult gnats. The best way to control fungus gnats is to reduce the amount of water you feed the infested plants. Reducing the watering of your plants will allow the soil surface to dry out, which kills the gnat larvae and starts to break the life cycle of the bugs in soil. At the same time, you’ll need to clean up any decaying organic material from the soil surface. Organic material, like fallen leaves, broken stems, and similar matter, serves as a food source for the insects. Add some coffee grounds for plants to the top layer of the soil to help with drainage, so your plants receive the water they need without becoming overwatered. You can also use yellow sticky traps to deal with the adult fungus gnats that are flying around your plants. You can pick these up at your local home improvement store, or create your own using brightly colored index cards and honey. Cut the index cards into smaller pieces and spread honey on one side. Lay the pieces of paper around your plants, or attach them to wooden or plastic sticks and place them in the potting soil. When the traps become covered with gnats, replace them. A natural predator of soil gnats is the Hypoaspis aculeifer. When they are released into the soil, these beneficial insects prowl the area and attack the fungus gnat larvae as they feed on the decaying organic material in your garden and potted plants. Soil drenches are chemical pesticides that will saturate the soil and kill insects and pathogens. Bacillus thuringiensis (Bti) is a soil bacterium that occurs naturally and is the only microbial insecticide available for everyday use. When you use a Bti soil drench in your garden or potted plants, it saturates the soil and coats the plant root hairs, providing a toxic snack for fungus gnat larvae. Soil gnats are annoying little insects, but once you know how to control fungus gnats properly, you can keep them from turning your plants into a buffet table. These simple tricks can help you deal with a fungus gnat infestation and prevent them from coming back. We hope you enjoyed the article on how to deal with soil gnats. If you found the information useful, please feel free to share the article with your friends and family.